Do you paint Easter eggs? If you do, then you probably paint it with a paintbrush or just dye it. Well, if a traditional Ukranian Easter egg was put beside your egg, then your egg would look totally different than that traditional one. Long ago, in Ukraine lived the Slavs. They were not yet christianized, so they had a lot of gods. They believed that birds (the ones that fly away in autumn) know much more than people, because they fly and see, in the southern countries, things that the slavic people didn’t see themselves. So,they thought that their eggs are holy. The Slavs painted their gods or symbols on their eggs. Of course they didn’t use the same kind of paint, or their pens didn’t look the same as our modern ones today. 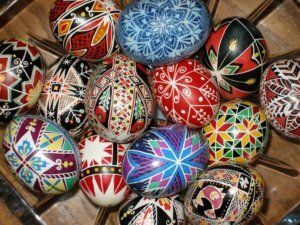 Today, Ukrainian Easter eggs are painted very carefully with a kistka. A kistka is the word in Ukrainian for a « wax pen », which is a pen that you have to fill up with natural bee wax and then melt over a candle. First you use a special tool to make a little hole in the top of the egg. Then you pump out the egg yolk (and the egg whites) out of the egg and let it dry for a little bit. Now comes the decoration part: You will need a kistka, bee wax, a candle, dyes, and of course the egg(s). You start by preparing the dyes (read the instructions on the dye’s lable). Then, you take some bee wax and put it on the kistka. After that, you heat it over the candle and start drawing on the egg. Remember, everything that you draw on the egg will be the same color as the egg. So,if you dye the egg and draw, it will be that color in the end because in the end you will melt all of the wax. 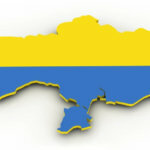 Now I told you everything you should know about the history and producing of the Ukrainian Easter egg. Have fun! If you want to know more, go to the Easter egg museum in Kolomyia, Ukraine.